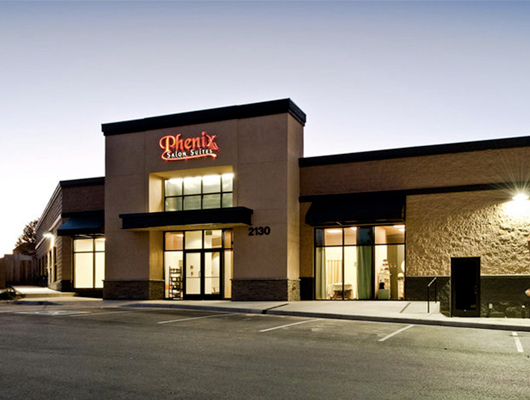 Phenix Salon Suites is coming to Chandler which is recognized as "Best places to live" by Money Magazine! Phenix Chandler store is at 3450 West Chandler BLVD suite 1, Chandler AZ 85226. It is right off high way-101 and 202. Chandler store is located in the heart of the Southeast Valley's fashion and entermainment hub. It is surround by Chandler Fashion Mall, Chander Fesitval and Chandler Village Center and Boulevard shops. You and your clients will enjoy convenient parking near your salon. Before or after their appointments, your clients can visit several popular businesses in the same shopping center (including Hobby Lobby, Walmart, Abuelo's Mexican Food, Bank of America, Cafe Rio, Men's Warehouse, Olive Garden. Oreck Pastries N Chaat, Pieology, Red Robin, uptown Cheapskate and many more), or Chandler fashion mall/Harkins Theatres just cross the street. This is a fantastic opportunity to join the "Phenix Family" and build your business with your own private, uniquely decorated suite. We provide you professionals freedom to customize your suite in your way! It is your dream. Be bold and creative. Please call us at 480-696-9886 for a personalized tour , and find out how we can help and expand your business step by step.